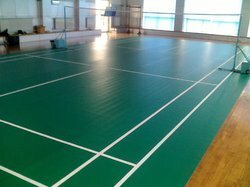 Prominent & Leading Manufacturer from Jaipur, we offer badminton court pvc flooring and badminton wooden flooring. As an esteemed company, we are engaged in providing the broad spectrum of Indoor Court to our valuable clients. These courts are made available in various customized options, these are mainly used in stadiums. Manufactured using the best grade basic minerals and latest technology in adherence to universal norms, these courts are highly acclaimed in the market for their supreme finish and polish. 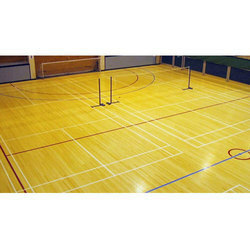 As an esteemed company, we are engaged in providing the broad spectrum of Badminton Wooden Flooring to our valuable clients. These courts are made available in various customized options, these are mainly used in stadiums. Manufactured using the best grade basic minerals and latest technology in adherence to universal norms, these courts are highly acclaimed in the market for their supreme finish and polish.